1. When your house is clean, you look around and say, “Wow, we don’t have that much stuff to move. Hooray!” You laugh and pat yourself on the back for having 2 yard sales and getting rid of so much stuff. Then you open up a kitchen cabinet and realize you have to pack all that ‘must have’ culinary stuff. 2. Damn. We’re gonna need more boxes. 3. When you rarely open the closet in your husband’s home office, and, when you do, an avalanche of crap pours out. Have to pack that crap too. 4. Damn. We’re gonna need more boxes. 5. When you own what seems like 1,000 different pairs of shoes & purses that you cannot, will not, and must not part with, but have absolutely no idea how they will be transported or where they will reside at your new, smaller residence. Call the architect. Must add a larger closet. 6. Damn. We’re gonna need more boxes. 7. When you decide it’s a good idea to go through stuff before you pack it, just to see if you can throw anything away. Five hours later you’re still looking through old photos & now in tears. Must keep everything. 8. Damn. We’re gonna need more boxes. 9. No. I’m not a pack rat. Why do you ask? Then you realize you are a pack rat ... Damn. We’re gonna need more boxes. 10. When you realize that you shouldn’t have listened to your husband when he said, “we can do this ourselves.” Note to self – don’t listen to husband ever again. Damn him. 11. When you realize you’re somewhat of a control freak and that is indeed why you didn’t want others helping to pack your house up. Damn me. 12. When the scary mortgage monster rears its hideous, incompetent head the week of closing and it gets delayed another week. Damn Bank of America! 13. When you wake up in the morning and stub your toe on a box that wasn’t there yesterday morning, but it’s there now. Then reality hits that you have still have much more packing to do. 14. Damn. We’re gonna need more boxes. Need coffee. Cannot cope without coffee. 15. When you had no idea that that many expletives could be said during the course of the day. Damn moving. Never doing it again! I had the pleasure of participating in this show held in conjunction with the Half Moon Bay Pumpkin Festival this last weekend. Logistically it's a tough show to set up and tear down but the crowds are amazing, great music and food plus an excellent vendor hospitality suite. A lot of people fell in love with my creations which is so exciting. I hope to "see" many of them for years to come. I've also promised Christmas items to a few special customers. They'll start showing up here probably mid November. If you need something sooner please let me know. I'll try to accomodate your request. New shows have been added to my calendar. Please take a peek and note the dates. I hope to see you at one or more since each show will have different products. I'll post sneak peeks as items are finished for each show. I meant to post yesterday about my final class at Art & Soul. OMG - I definitely saved the best for last. The instructor, Shelly Massey, is awesome. Her style is bright & whimsical. Our project was to determine a subject then make key pieces from cardboard and plastercloth. Messy to say the least but really fun to create with. Will be applying some plastercloth to some products for upcoming shows. It's a shame you can't see how 3 dimensional it is. I wanted the license plate to be as visible as possible so the bottom heart is raised up about 1/2" so you can look under it. The 2nd and 3rd hearts are raised about 1/4" from the one below. Of course there's one of my clay angels watching over the garden (behind the fence) and a faucet flower adds a bit of whimsy. 1 month until Flint Street at VSA Arts. I'm reviving my wood garden girls, wood/aluminum/mixed media flowers & welcome signs plus much more. Will post pictures as new creations are finished. Attending an art retreat has been on my bucket list for a very long time. Today my dream started to be fufilled with Day 1 of Art & Soul Retreat in Las Vegas. 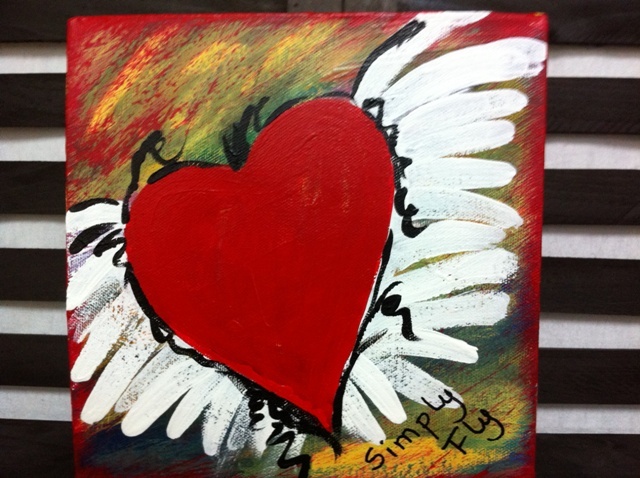 Today's class was Be Still My Heart with Lisa Kaus. HUGE yard sale of art, craft & wood supplies & much more! 861 Country Estates Circle, Reno. 1000s of patterns for dolls, lap quilts, stuffed animals, quilts, wall hangings, dolls, clothing, costumes & more! Blue Twig Studio just celebrated its 1-year birthday and is offering a giveaway on their Blog to celebrate! How do you win? Click on Blue Twig Studio above and then comment at the bottom of the birthday post. Share on Facebook or other social medias and earn extra chances to win. It's that simple. What do you win? Fun goodies from the store of course! Flint St., Court St., Arlington Ave.
Flint Street will be closed and brimming with local artisans! home décor & much more! vWild Thyme BBQ on the courtyard with delicious food/drink for sale. v Free Tours of the historic Lake Mansion. v Wine Walk 2 pm – 5 pm, $20 per person. v An ARTOWN Festival event! HUGE liquidation sale of art, craft & wood supplies. Saturday, April 14th, 8:30 AM – 2 PM at 861 Country Estates Circle, Reno. Cash only. Mark your calendar for April 14th if you live in the Reno/Sparks area. I will be having a HUGE yard sale featuring all kinds of art & craft supplies; fabrics; fat quarters; patterns; some display pieces such as spinning racks to hold magazines, comic books, patterns, etc; and MUCH MORE! Time will be 9 AM - 3 PM. Specific details will be posted the week of the sale. Random.org picked #16 as the winner of this month's giveaway. That is Bonnie Botts. 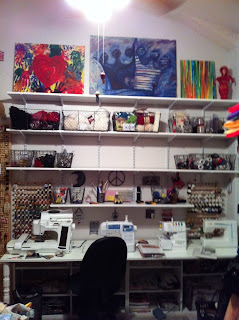 I have closed my Artfire studio due to lack of sales. Am going to give Etsy a try. Will post links as soon as I have product uploaded. Here's a little teaser for you. I'm hosting a small intimate event December 1, 2012. I'm calling it "Randi's Merry Magpie Christmas Boutique" and it will be by invitation only. Details for this event will be posted here in a couple months. Lots of details to work out. In the meantime - SAVE THE DATE! This month's giveaway is an original piece of my artwork. It measures almost 8" square. How do you enter? Just become a member of this blog. That's it. The drawing will be February 29th. (Wow - this is a leap year!) I enter the number of members the blog has in random.org and it picks a number. Winner will be posted here and emailed. Your artwork will be on it's way once you provide a mailing address. If the prize is not claimed within 48 hours I will choose another winner. Good morning! Just a quick post to show off my latest painting. 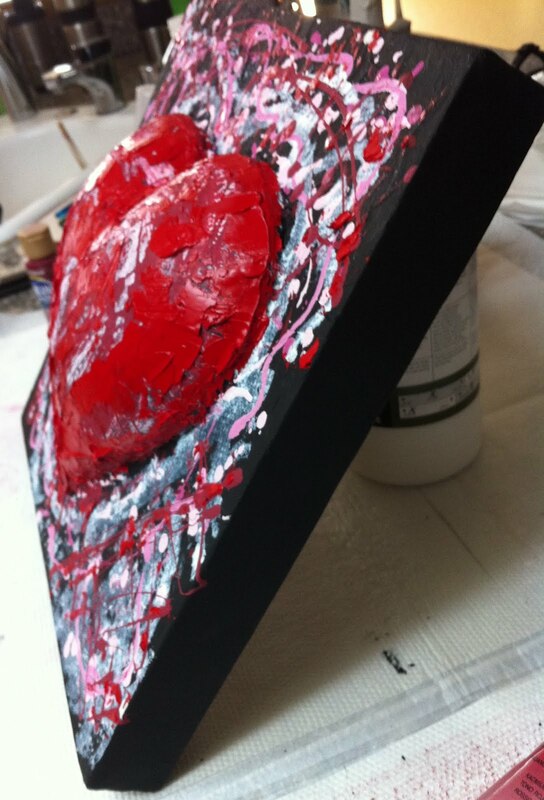 It's titled "Love is Messy" and is a mixed media, dimensional, acrylic & oil piece. It measures 12" square. I discovered a new service in Reno a few weeks ago that could dramatically change me. It’s called micro-current facials. They’re a healthy way to smooth wrinkles, firm sagging skin and decrease cellulite without going under the knife or being lasered. It’s a simple, relaxing process. There is no pain. There is no recovery time. Best of all, you see the difference after just 1 treatment. It’s basically a lunch time facelift. There’s only 1 machine in Reno and it’s at Balanced Health Solutions, 1625 E. Prater Way, Suite 103, Sparks, NV. You can read about it on their website by clicking here Balanced Health Solutions. I had my complimentary 30 minute micro-current facial this morning. I was filled with hope but had plenty of doubts too. The first thing I noticed was how healthy my skin looked. Then I noticed how much firmer my neck was; my cheeks were emphasized and eyebrows raised. I will be 60 in April and this is the year of ME. I didn’t hesitate to sign up for a full treatment package – ten 45 minute sessions. You receive 2 complimentary sessions when choosing this package, for a total of 12. From now until April 25th I’ll have weekly treatments and post updates. I took pictures this morning before and after. Will continue taking pictures each week. At the end I’ll show the difference from 1st appointment to last. Stay tuned. Want to try it yourself? Call Chris @ (775)358-6824. Tell her you read a post on Randi’s blog! The number generated by random.org (1-21) is #21 which is Dana B. Please email your addy to me at randi.case@gmail.com. I'll mail the watch right away. Hope you enjoy it. February's giveaway will be posted on February 1st. Drawing to be February 10th so the winner can have their gift by Valentine's Day! 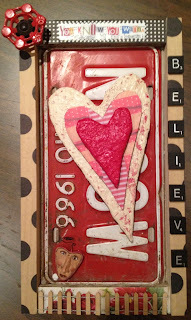 I want to give away a piece of art or something else I've created, once a month, on the blog. The only requirement to participate is that you must be a member of the blog. On the date set to draw a winner I will print out the names of all the members, cut them in strips, place in a bowl and draw a name. That's it. This month is offering a little bling. It's a cute little watch by Accutime. 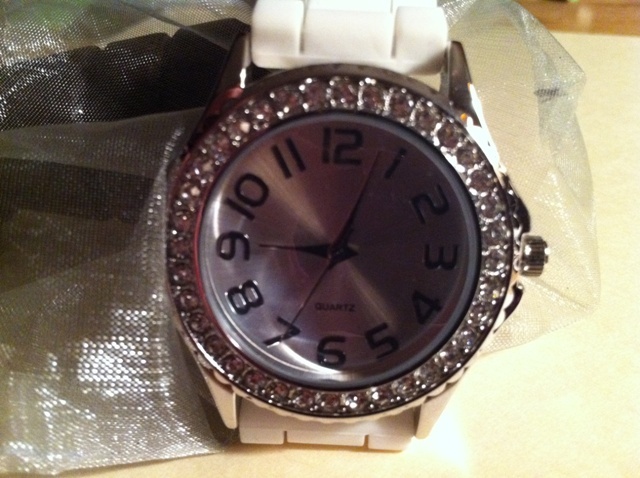 The face is surrounded by crystals and the band is white. Watch is new and comes in a silver net bag. Lots of bling to brighten your winter days! I'll announce the winner and send them a message. I will need an address to mail the watch to. If the winner doesn't respond within 48 hours then I'll draw again. Will keep going until a winner responds. OK? If you're not a member of this blog - join now! The drawing will be held January 29, 2012. Good luck. My previous post about 2012 shaping up has created a lot of interest in one of the paintings in the “after” pic. Many have expressed how much they love it and some have made offers to purchase it. It’s titled Queen of Hearts and is the last gift I received from my best friend. 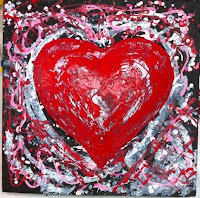 I’ve always loved hearts and she had joked for many years I was the Queen of Hearts. The crown is very easy to see but you can only see the heart in the close up. Tragically my best friend died in a 2004 house fire. I miss her terribly but smile inside every time I look at this painting. I'm sure you can understand why this painting is not for sale. I really looked forward to 2012. 2011 was disappointing in so many ways. As the first days of 2012 unfolded I began to fear another bad year. How can this be? I thought. I've always been a glass half full kind of person so I decided I needed to take action, change my surroundings. 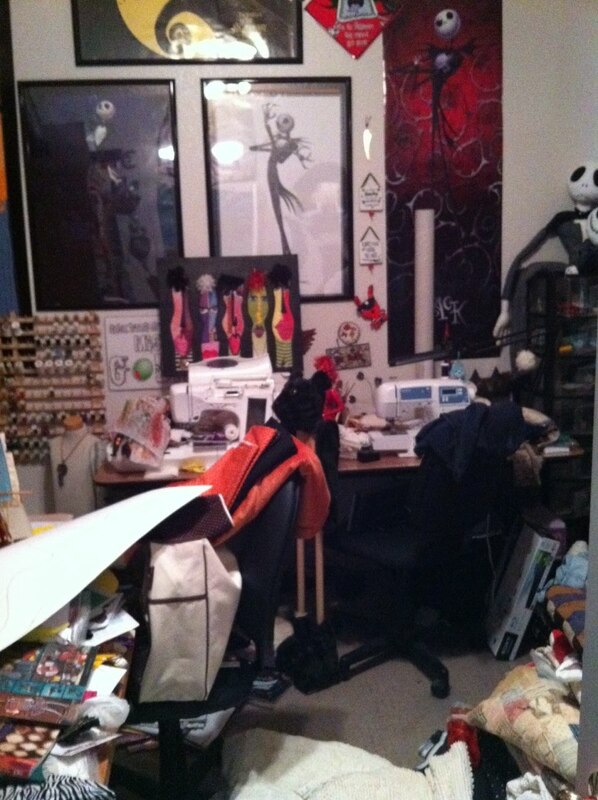 I decided to start with my sewing room since I spend a lot of time in there. It's a VERY small room, measuring about 10x11. The only redeeming factor is that it has 12' ceilings preventing it from becoming claustrophobic. Unfortunately it gets very messy as the last show of the season approaches. And it sits, until the holidays are over. Quite depressing as you can see from the following picture. I never dreamed I'd see the day that my room would look like this. Messy, dark, gloomy, creativity killer. It was my call to action. Change this eyesore, organize it, lighten it up, get storage room, get rid of stuff! Off to Home Depot to explore my options. I decided 8' long shelves on standards would be a great solution. I thought 4 would be perfect but I discovered 5 would fit. I designed a sewing table 8' wide that would allow all 4 of my machines to be available at all times. 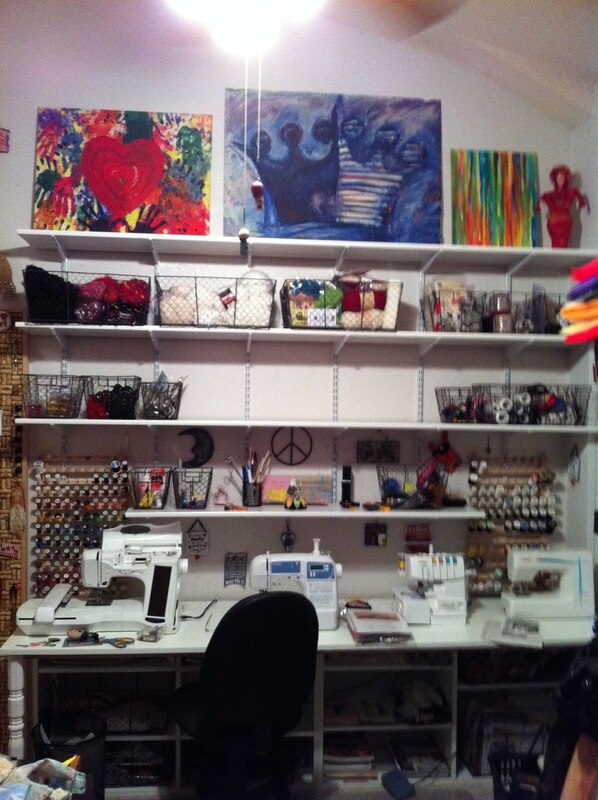 It has storage shelves below which are presently filled with unfinished projects. Storage containers that allowed the contents to be visible were a must, but no plastic. I discovered chicken wire baskets at World Market in 3 sizes. A bit pricey but they were so perfect I ignored the price and bought them. A little decorating and this is the result. What a difference! The date has been changed for the Valentine show @ Ryries. It will be held Thursday February 9, 2012 from 4-7 PM. Featured artists are Bryn McCubbins, Katie Packham and myself, Randi Case. Mark your calendars. Hope to see you there!